The team of NASA and Johns Hopkins University Applied Physics Laboratory has fully integrated a spacecraft that is scheduled to launch in August on a mission to study the sun up close. 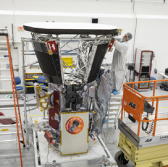 NASA said Thursday an eight-foot-diameter heat shield was reinstalled on Parker Solar Probe last week after engineers initially attached the system to the spacecraft as part of tests that occurred at the APL facility in Laurel, Md., last fall. Both the probe and its Thermal Protection System completed separate test and evaluation procedures at the space agency’s Goddard Space Flight Center before transferring to an Astrotech Space Operations facility in Titusville, Fla., in April for pre-launch processing. TPS features a 4.5-inch thick carbon foam core in between two carbon composite panels and a white coat geared to maintain an 85-degree Fahrenheit temperature for the spacecraft and payload instruments. The spacecraft will launch from the Cape Canaveral Air Force Station onboard United Launch Alliance‘s Delta IV Heavy rocket no earlier than Aug. 4, according to NASA. APL, which designed and built the probe, will also help the agency operate robotic vehicle throughout the mission.